FINAL APPLICATION DEADLINE: MIDNIGHT TONIGHT! 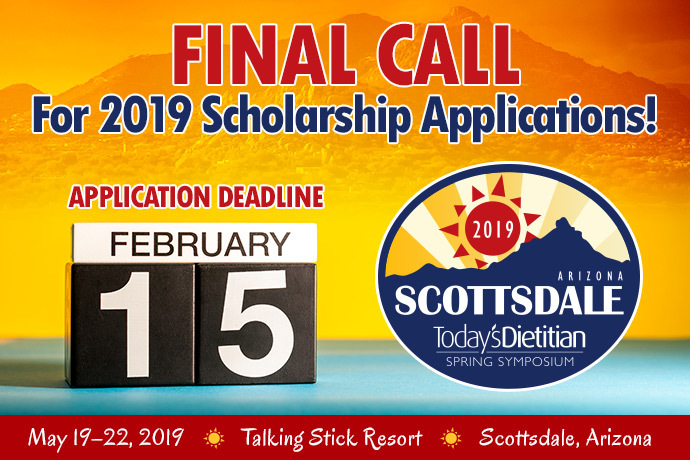 Today’s Dietitian has a VERY limited number of scholarships remaining for complimentary registration to our 2019 Spring Symposium in Scottsdale, Arizona, on May 19–22. Valued at up to $499, this scholarship covers all registration costs* for the event including educational sessions led by respected experts, CEUs, and on-site opportunities to network with presenters and peers. Applicants will be considered on a first come, first served basis through MIDNIGHT TONIGHT, so be sure to apply at your earliest convenience for your best chance of acceptance! Recipients will be notified on or before February 22. Visit TodaysDietitian.com/SS19 to apply before tonight's deadline!